We’re launching a new service for you investors out there. As you all know, sometimes we spot a new advertising campaign that is a complete miss. In fact, we straight out say it’s going to fail so badly that the ad agency is going to get fired. Well, every time we made that prediction the agency would get fired but something else would happen. The Company Stock Would Tank to the tune of around 15%. It happened with Weight Watchers, PetSmart & Tiffany. 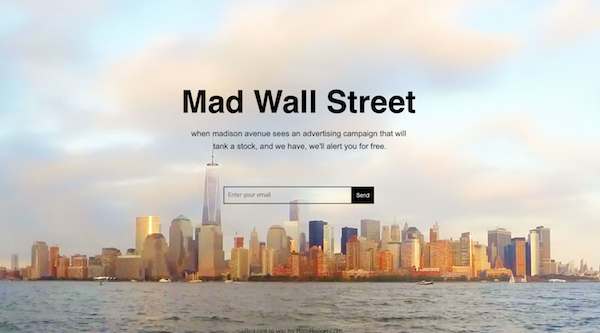 So now on MadWallSt.com, we’ll be reporting on just that: Campaigns we think are going to tank the company stock. I know it’s kinda mean to the agency that did the work but hey, what are ya going to do? So go to MadWallSt.com and subscribe to our stock alerts. They won’t be happening often but when they do, you’ll want to be in the know.